What a city! Every time I come to Barcelona I am wondering why am I not already living here? The city is blessed with beautiful weather, nice beaches and stunning architecture as far as the eye can see. On top of that the food is amazing and don't even get me started on the coffee scene! 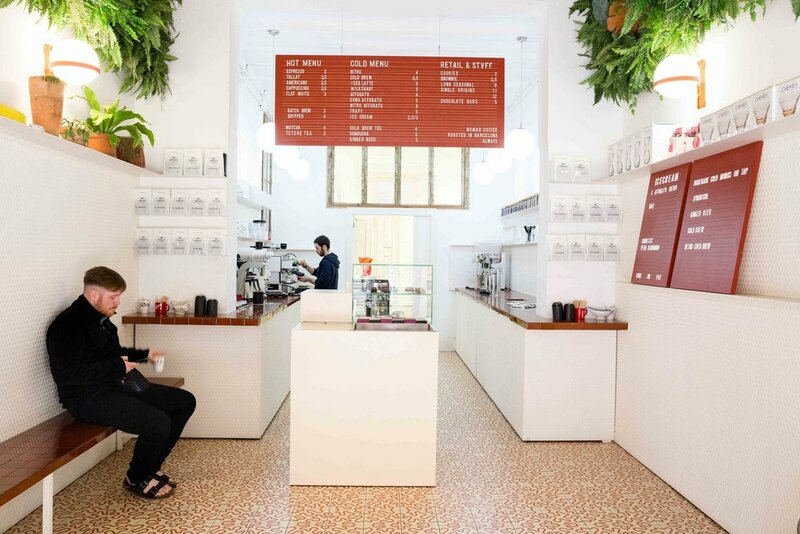 Cafes and specialty coffee shops in Barcelona are plentiful and scattered across this diverse urban playground. This time around I did some in depth exploring of all the brewing and pouring - and let's just say, I'm impressed! Here's what I found. Describing SlowMov in one word is impossible. It's a coffee shop, a roastery, a project, a movement, a think tank and a community space all in one. Two passionate individuals are behind it, Carmen and François, with support from Paris based roastery Coutume. It is also one of the few places in town that has a roaster (Giesen) on site. I was told it's quite difficult to obtain a permit for those in Barcelona. The majority of beans roasted by SlowMov have been imported by Coutume, Carmen tells me, as she is sipping on a Cortado in the cute courtyard out of a back door. It is quite a busy day for her, but she takes the time to sit down with me anyways. This is what SlowMov is all about, slowing down, staying in the moment and consuming responsibly. Her appreciation for specialty coffee was born while working in the gastronomy in Paris, while another great inspiration shaping her project was a trip to Ireland, where she came across the sustainable tourist guide "Slow Dublin". Needless to say that apart from espresso, you'll also encounter slow coffee at SlowMov. From Chemex, Aeropress, V60 to a French Press, the choice is yours to make! But the movement doesn't only care about quality coffee. The packaging for the coffee beans is biodegradable, all produce is local, seasonal and organic and everything is prepared with the utmost attention. The café is also designed in a way that encourages interaction, thanks to a large communal table and the lack of a counter separating barista and guest. Come in, leave your watch at home and get lost in the moment! The cosy Onna Coffee is located in Gracia since September 2014. It was first established in Poble-sec earlier that year and is considered one of the pioneers of specialty coffee in Barcelona. The roasting is taking place in Poble-nou area, from where both the coffee shop and wholesale clients are supplied with freshly roasted beans. Onna serves both espresso and pour-over using a selection of 3-4 different coffees with different varieties and processing methods to choose from. Beans are sourced mostly directly from farmers and for now exclusively from Costa Rica. The owner Faisal told me, that he is planning to extend the selection of coffee to other origins in the future. Syra Coffee is a small take-away spot that first opened in October 2015 and relocated within Gracia neighbourhood in June 2017. The owner Yassir, who is an architect by profession, created Syra as a passion project. The well thought out design of this place alone is a great draw, but I would also come back just for the delicious brew. Syra has a cooperation with San Agustin coffee roasters, who I had previously encountered on a trip to Palma de Mallorca, and served a washed Honduras La Rosa for espresso. Yassir has also opened a second Syra coffee bar following the same minimalist and compact approach in Eixample close to the metro Girona. Bermont opened up in 2016 and is run by Bernat, a Catalan who lived and worked with coffee in Australia. It was there that his passion for coffee grew, which he transmits relentlessly in his welcoming multi-roaster café. Apart from the stunning mural by a local artist another characteristic of Bermont is the 'no-sugar' policy that is reinforced without exceptions. Choose between aeropress, V60 or espresso based drinks and enjoy the full flavor without distractions. The internationally renowned roastery Nømad is no secret, but did you know it has 3 cafes scattered across Barcelona? Nømad Every Day is one of them, located in El Raval, and feels like a breeze of fresh air during a hot summer day thanks to it's ample setup. As it is more of a take-away shop the filter menu is limited to batch brew and dripper. The cold options are plentiful and include a sophisticated nitro affogato. Needless to say the seasonal coffees are of excellent quality! Come here every day or try one of the other Nømad's in town. 10 years ago there used to be a carpentry at this very place, where Xavi and Raquel have opened the huge wooden doors in June 2017 to coffee and art lovers. 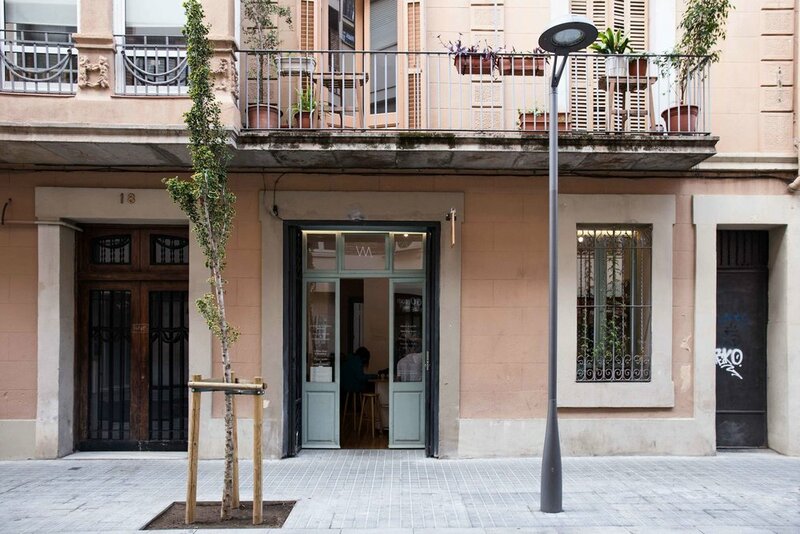 Tucked in a small alley of El Raval district, Departure is a café far from the hustle and bustle, yet right in the center of Barcelona. 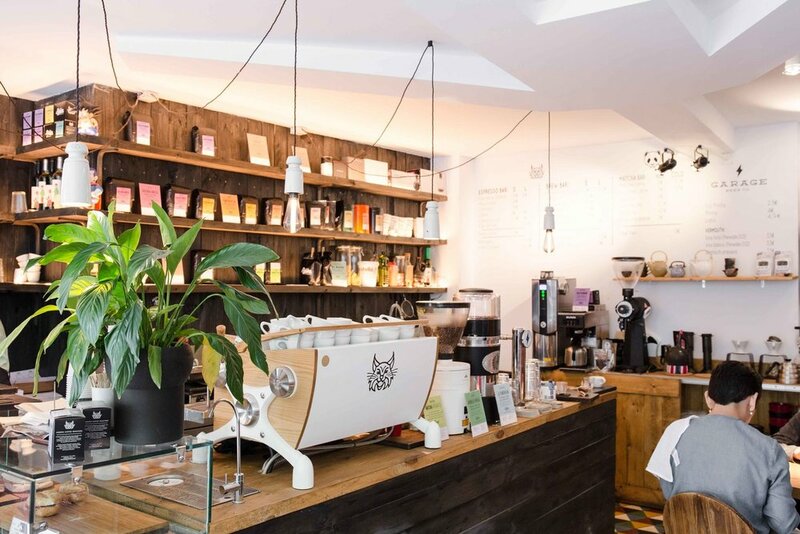 In terms of coffee as well as philosophy of life they found themselves to be aligning with the roastery and coffee shop SlowMov, their choice of beans for espresso. When it comes to filter the two want to keep an open mind and rotate both national and international guest roasters. For the moment Departure is hosting Puchero Coffee Roasters based in Valladolid. Before launching their own project, Xavi and Raquel have been researching the specialty coffee scene in Europe for two years. The preparation paid off and by combining this experience with personal preferences they managed to create a unique concept space with soul and character. The art displayed is changing every few weeks, accompanied by concerts and other events. Not so hidden anymore and definitely a locals favourite! In the residential area Les Corts a passionate bunch of cafecionados are running Hidden Cafe just a few minutes walk from the shopping mall L'illa Diagonal. They roast their own coffee in Casteldelfs, the same town where Rightside Coffee Roasters is based. It is a great spot for working on the laptop and the coffee is top notch. Two Marco’s and one Marc make up the three co-owners of Three Marks Coffee. 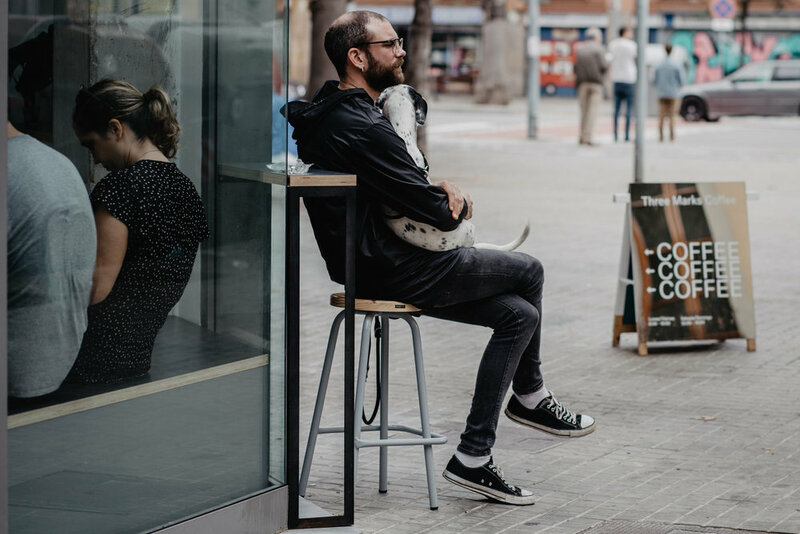 The specialty coffee shop opened up in August 2018 and is the first café of its kind in the neighbourhood of El Fort Pienc. It is their philosophy to bring quality coffee to the people of the Barrio and their aim to create a community space for them to enjoy it. The ample two-story café certainly has all the right features to be exactly that! Lots of natural light and a simple yet sophisticated interior design make this place a great hang-out spot. Although the roasting is done by Three Marks Coffee themselves, they do invite guest roasters to have more variety in the grinders. Two of the owners have worked at Barcelona’s most renowned roastery Nomad before. The ties are still strong - Nomad is currently available for filter coffee. For espresso Three Marks Coffee will invite you to explore the flavours of two single origins, Ethiopia and Guatemala. The warehouse office space Espacio 88 for architects houses one of Barcelona's most iconic spots to grab coffee: the SKYE Coffee truck. The 1972 Citroën HY matches marvelously with the pulse of the industrial area that is Poblenou. SKYE brew exclusively coffee roasted by Right Side and are also the organizers of the Barcelona Coffee Festival. Barcelona's Instagram darling doesn't disappoint when it comes to coffee. Espai Joliu is first and foremost a plant concept store with a great number of magazines but also hosts an art gallery and a cafe in the back with plenty of seating among succulents and traditional tiles. The founder Lucía is a graduate in design and lived in Berlin when she decided to create something exceptional in her home town. She has ties to the roastery Nomad but invited other guest roasters to the cafe as well. If you’re looking for the best brunch and breakfast cafes serving specialty coffee in Barcelona, check out my latest article!